The Bernstein Studio complex with its open-air stage at the right and the Perry-Davis/Ganahl mansion at the left. A sliver of Boyle Avenue is at the lower right corner. The photo, dating from around 1917, is courtesy of Marc Wanamaker/Bison Archives. Click on this or any photo to see them in a new window and in a larger view. From the time that motion pictures were first filmed in the Los Angeles area around the turn of the 20th century, the industry has, obviously, been identified with Hollywood. The first studios, however, were in Edendale (the Silver lake/Echo Park/Los Feliz area) and others eventually were established in Culver City, Universal City, Burbank, Lincoln Heights and elsewhere. There were two film studios in Boyle Heights, one being the Majestic Studios where Charlie Chaplin made some movies and which was located on Fairview Avenue in the north end of the community near where Interstates 5 and 10 and U. S. 101 are located. 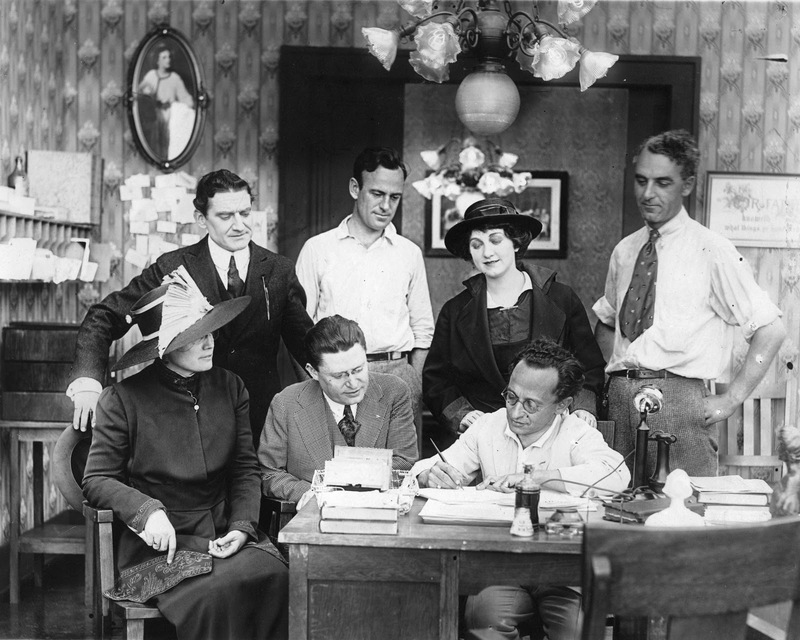 A second location has been researched by John Mandel, this comprising the Bernstein Studio, which operated on South Boyle Avenue near the Daughters of Charity orphanage, though it produced only three films in 1917 and 1918. Its founder, Isadore Bernstein, came to Los Angeles from New York in 1913. Possibly a relative of Carl Laemmle, the founder and chief of Universal Studios, Bernstein worked for Universal for a few years before deciding to strike out on his own. A Los Angeles Times article from early December 1916 outlined his efforts to built a studio for two enterprises, his own Bernstein Productions Corporation and the Cleo Madison Film Corporation. This latter was built around Madison, a Universal star actress, who made about eighty movies in the early to mid 1910s, but who never shot a film with Bernstein. Instead, his leading lady for the three movies made at the Boyle Heights studio was Betty (Rosetta) Brice, who made several dozen films from 1913 to 1924. Mandel, through much digging, discovered the actual location of the Bernstein Studio site and this contributor and Boyle Heights Historical Society president Diana Ybarra assisted in identifying some of the ownership and history of the property, which was an eight-acre parcel and was reported to have been purchased by Bernstein for $100,000. Rather than the William H. Perry estate, however, it was actually known as the Perry-Davis estate. The Perry here was the lumber baron's daughter Mamie, while the Davis was her husband, Charles. Mary B. (Mamie) Perry Davis Wood (1861-1949) was, with her first husband Charles W. Davis, the owner of the mansion that became the headquarters for the Bernstein Studio at the northwest corner of Boyle and Stephenson (now Whittier Boulevard) avenues in Boyle Heights. After Davis's death, the property was owned by lumber yard owner Fidel Ganahl for a period in the 1890s. This image comes from the Illustrated History of Los Angeles County, 1889. Apprenticed as a cabinet maker, Perry soon opened a furniture store, said to be the first in Los Angeles and had a partner named Brady before teaming up with Wallace Woodworth in 1858. Perry and Woodworth worked first in furniture making and then, from 1873 when Los Angeles was in its first boom period, in dealing with lumber and building materials. 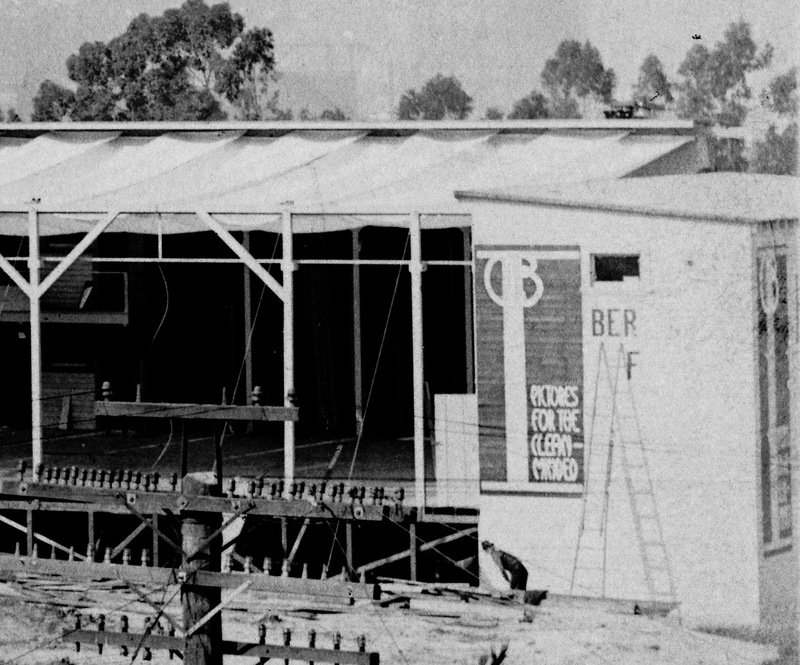 After Woodworth's death in 1883, Perry continued under the name of W. H. Perry Lumber and Mill Company and he did his own milling in the forests where the trees were harvested on his timber lands, shipped the product in his own vessels to wharves at San Pedro built by him, and delivered the finished materials to customers directly. Perry, in fact, owned several other lumber-related companies for trade in Arizona, San Bernardino County and elsewhere. He also organized, in 1865, the Los Angeles City Gas Company, building a gas works across from the Plaza, and ran the firm for five years before selling it. He was the president of the Los Angeles City Water Company and was involved in other business enterprises, including insurance, land and water development, and more. 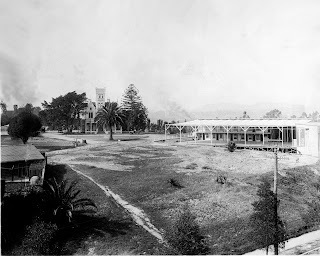 In 1858, Perry married Elizabeth Dalton, a native of Los Angeles, whose father George was born in England and who was the brother of Henry Dalton, a migrant of the 1840s to Mexican Los Angeles and a merchant and owner of several San Gabriel Valley ranches, including Santa Anita, San Franciscquito, and Azusa. George Dalton emigrated with his wife and one child to the U.S. in 1837 and wound up in Circleville, Ohio, south of Columbus and a few dozen miles from where William Perry was from. After his first wife died, George married a widower, Elizabeth Jenkins, and then brought his family to Los Angeles in 1851 at the urging of his brother, Henry. George had a farm south of the city at Washington Boulevard and Central Avenue, where he raised his family including Elizabeth, died in 1892, and is buried at Evergreen Cemetery in Boyle Heights. Known as the Perry-Davis place in an 1890 Los Angeles Herald article, the opulent mansion at the northwest corner of Boyle and Stephenson (Whittier Boulevard) avenues in Boyle Heights, was probably built by lumber magnate William H. Perry for his daughter Mary (Mamie) and her husband, Charles W. Davis. Davis died about two years after their 1883 marriage and the house, by 1890, was owned by lumber operator, Fidel Ganahl. When purchased by Isadore Bernstein for his fledgling studio, the parcel was owned by a Mary Turner. The photo was located by Diana Ybarra of the Boyle Heights Historical Society and is courtesy of the Los Angeles Public Library. William and Elizabeth Perry's daughter Mary B. (or Mamie) was born in 1861 and quickly showed a great facility for music, especially singing. In 1880, having performed in Los Angeles for a period of time, she went to Italy to further her studies in operatic singing. She made her debut there there following year and, known as "Maria Perrini," her high soprano brought her some renown. Returning to Los Angeles, however, Mamie married musician Charles W. Davis in 1883. It can be assumed that the estate named for the two was presented as a gift by her father, who likely built the impressive residence there. Davis, however, suffered from tuberculosis, which may have brought him to semi-arid Los Angeles, and died in July 1885. Presumably, Mamie Davis sold the house and estate on South Boyle not long after her husband's early and untimely death. A biography and photograph (see above) of her appeared in an 1889 Illustrated History of Los Angeles County and it seems she still lived in the house. In 1888, she married another musician, Charles M. Wood, a native of Springfield, Illinois, who manged the Los Angeles Theatre and later turned to the real estate business. The couple remained in Los Angeles, living with her parents and, after William Perry's 1906 death, in several residences in the city. Wood died in 1928 and Mamie in 1949, when she was in her late eighties. Interestingly, their daughter Elizabeth married James Stack and this couple's son was the renowned actor Robert Stack. Mamie Perry Davis Wood's passport application photo from 1924 as obtained from Ancestry.com. After marrying musician Charles Wood in 1888, Mamie continued to perform for benefit concerts and other events and lived in Los Angeles until her death in 1949. Notably, her great-grandson was actor Robert Stack. By June 1890, the Perry-Davis property had a different owner, as profiled in a lengthy article about Boyle Heights in the Los Angeles Herald newspaper. A reporter toured the neighborhood, which had grown dramatically during the great land boom of 1887-88, but, like the rest of the Los Angeles region, had seen a contraction in the years afterward. In any event, the correspondent left the residence of Elizabeth Hollenbeck (covered in a recent post here), which was soon to become the Hollenbeck Home for the Aged, and wrote, "Just beyond this is the unique and magnificent residence of Mr. Fidel Ganahl. It has usually been known as the Perry-Davis Place. It would ornament any city in the country." ﻿﻿Fidel Ganahl was born in Schruns, Austria, in the far western part of the country near the Swiss and French borders, in 1849. He emigrated with his family to America in 1866 and settled in St. Louis, where the Ganahls became well-known in the lumber business. He remained there until about 1890 when he relocated to Los Angeles and joined his brothers, Frank and Christian, in forming the Ganahl Lumber Company, which became a major firm and still exists today. It is notable that the Perry-Davis estate had two consecutive owners with ties to the lumber industry. In the 1890 and 1891 Los Angeles city directories, Ganahl's residential address is given as the northwest corner of Boyle and Stephenson avenues, with Stephenson later becoming Whittier Boulevard. His stay at the house, however, was also somewhat brief as, in May 1896, he left the Ganahl Lumber Company and made his way back to St. Louis. Ganahl continued in the lumber business there for another twenty years, but maintained his ties to southern California. In 1916, he bought a ranch at Corona in Riverside County and, after his wife's death three years later, moved there. He died in 1921 and the Corona ranch remained in the family hands for at least 75 years more. It is not known yet who owned and/or occupied the Perry-Davis estate for the twenty years between Fidel Ganahl's departure and the sale in 1916 to Isadore Bernstein, who was reported in the Times article to have bought the property from a Mary Turner, for whom the eight-acre tract was held in trust. The signing of the the contract for the first movie produced by the Bernstein Film Company, ca. 1917. Company founder Isadore Bernstein is seated at the desk. Seated to his right are Sam Wood and Grace Kingsley of the Los Angeles Times. Standing from left to right are Murdock McQuarrie, an unidentified man, star Betty (Rosetta) Brice, and director Jack Pratt. Courtesy of Marc Wanamaker/Bison Archives. As thoroughly documented by John Mandel, the Bernstein Studio included a main filming area of over 150 x 50 feet leveled on over 750 concrete piles on the hillside location, with the Perry-Davis/Ganahl house serving as studio headquarters. Mandel noted that Bernstein promoted his enterprise as making films "for the clean-minded millions" and had a motto of "Pictures for the Clean-Minded" painted on the wall of the studio facing the Daughters of Charity orphanage—perhaps to assure the nuns of his good intent! Moreover, Mandel observed that Bernstein had managed a boys' home in New York and, though a Jew, edited the Christian Herald there. This detail at the Bernstein Studio shows a banner with the studio's motto, "Pictures For The Clean-Minded." Courtesy of Marc Wanamaker/Bison Archives. Though he had grand plans for a seven-film series that was motivated by a pure ideal of romantic love, rather than base passions and lust, the epic never was filmed and the three films produced by the studio consisted of a western and two dramas. These movies, Who Knows (1917), Loyalty (1917) and Humility (1918) appear to have striven for the clean approach Bernstein promised. Another film, the 1917 comedy Nuts in May, was filmed at the studio and its star, in his first such role, was comedian Stan Laurel, who was paid all of $75 for his work. Mandel also learned that, by April 1919, Bernstein was no longer involved in the studio, having taken on the presidency of the National Film Corporation. He had short tenures at Universal and a San Mateo studio called Pacific Studios before having what may have been a nervous breakdown. Later, however, he became a writer for Universal and worked on some 65 projects until 1938. Leaving the film industry, he worked for an oil tool company before his death in 1944. This publicity shot from March 1917, titled "Bernstein's / The first turn of / the camera," shows the studio chief turning the crank of the tripod-mounted device at the far right, while the cast and crew look on. Courtesy of Marc Wanamaker/Bison Archives. 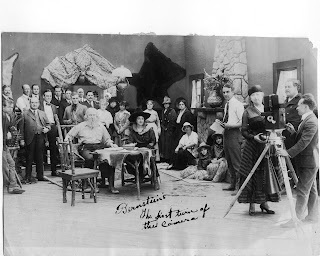 As for Boyle Heights studio, it continued on under different ownership with the Ormsby Film Corporation making a picture there in 1920; P. D. Sargent producing two films there in 1921 and 1922; and there was an "American Studio" shown there in the 1924 Los Angeles City Directory. Mandel discovered, however, that apartment buildings were on the property by the mid-1920s, though it is not known when the Perry-Davis/Ganahl mansion was razed, perhaps during the construction of Interstate 5 in the 1950s. Today, apartments cover what is left of the eight-acre parcel. Contribution by Paul R. Spitzzeri, Assistant Director, Workman and Temple Family Homestead Museum, City of Industry, California. Information on the Bernstein Studio is from John Mandel. Assistance in identifying the Perry-Davis estate came from Diana Ybarra, president of the Boyle Heights Historical Society. Thanks are also extended to Marc Wanamaker and his Bison Archives, an amazing treasure trove of film-related material, for permission to use photos from the archives. 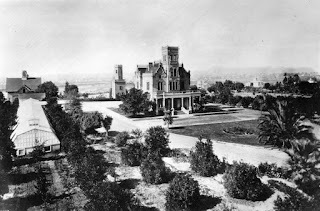 I've often wondered why the Perry mansion that is at Heritage Square didn't look more like the photo that is often shown of it when it was in Boyle Heights. But now - if I am reading your article correctly - there were two different Perry homes. Hello Brady, that's right, there were two different Perry houses. William H. Perry's residence was about a mile or so north of the home of his daughter Mamie, which is discussed here. They were built probably seven years apart and had very different appearances and sizes. Thanks for the comment! Who can I discuss the Bernstein studios with. Isadore was my relative. I have hundreds of photos and would like help on what significance they have. Hi Amy, send an e-mail to p.spitzzeri@homesteadmuseum.org and I can see if the main source of info on this post can be contacted and then get in touch with you. Thanks!